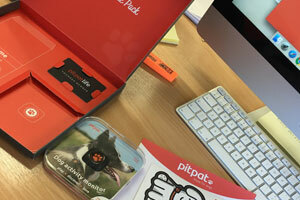 I received my Pitpat in a handy box including a membership card, Eukanuba food sample, a keychain for a collar, some stickers, and the Pitpat itself. It felt really personal. It’s always a surprise to get more in a gift than you expected! Being a fitness fanatic myself, I couldn’t wait to take my dog out on a walk and see how many calories she would burn by walking for her maximum time. My dog is 9 years old, so the Pitpat collated all her breed details and information and decided on a target that she should be hitting every day. Set up was very simple. I downloaded the app to my phone, chose her weight, breed and age and Pitpat simply gave her a target to start hitting straight away. Her target is 35 minutes which is more than I expected, but since getting this information she has been exceeding this target every day. The Pitpat records when they are resting, playing, pottering, walking and running. It’s been handy to see what she’s getting up to whilstwe’re out of the house! We’ve had many occasions where we’ve checked the PitPat data and seen that she’s been up and about whilst we’ve been away (who knows what she was getting up to!). There’s a handy chart underneath the data on the main screen, which gives a basic overview of their most active times during the day. The most surprising element of all this, is that she’s been doing a lot more exercise than I originally thought she did. All you need to do at times throughout the day or at the end of the day, is open the app and press the paw button on your Pitpat. It’s super easy to use, and the fact that it’s mostly controlled on your phone is very handy and efficient. If you feel like you need some extra ways to keep your dog active, or an excuse to get yourself out and about too, then this is the perfect product to invest in. If you have a furry friend, get out on a walk and start hitting those goals for the benefit of you and your pup! Visit https://www.pitpat.com/ for more information on prices and memberships.